Harrington’s juxtaposition of the religious and the natural is on bravura display in “Agape Agave.” Courtesy Artspace 111. Healthy dollops of praise should be lavished on Artspace 111 for providing an enjoyable and efficient primer on the virtues of pure abstraction and its more familiar sibling, whimsically rendered realism. Thanks to 18 pieces by Peter Harrington in An Expansive Moment at the Accordion Temple and the 11 works in Jeffrey Poole’s Playing Fields, no Artspace 111 patron can exit either show with a less than vivid appreciation for the contrast between Poole’s unabashed color-field abstractions and Harrington’s meticulously constructed, quasi-surreal representational works. Harrington’s preoccupations, in nearly all of his oil-on-canvas works, toggle between religious totems, their accenting iconography, and exuberant representations of manufactured and natural forms. Take the title piece. Leaving aside the metaphysical notion of an “expansive moment,” the highly recognizable church, with its elegantly curved cupola done in pale baby blue, is presented as an accordion-shaped structure. That instrument’s telltale articulations form the spine of the temple, crowned by a dome — all set against an Edenic azure sky. “An Expansive Moment at the Accordion Temple” is the first of many Harrington works to inject winning whimsy into what might have been a cumbersome presentation of religious themes. Harrington leavens his preoccupation with the shape and color of religious architecture by welding them to everyday natural forms. In “Pinecone Pagoda,” a mammoth pinecone forms the shingled foundation under a pagoda temple’s roof –– and all of it set against what is Harrington’s preferred backdrop of a pale blue sky with the occasional wispy cloud passing through. 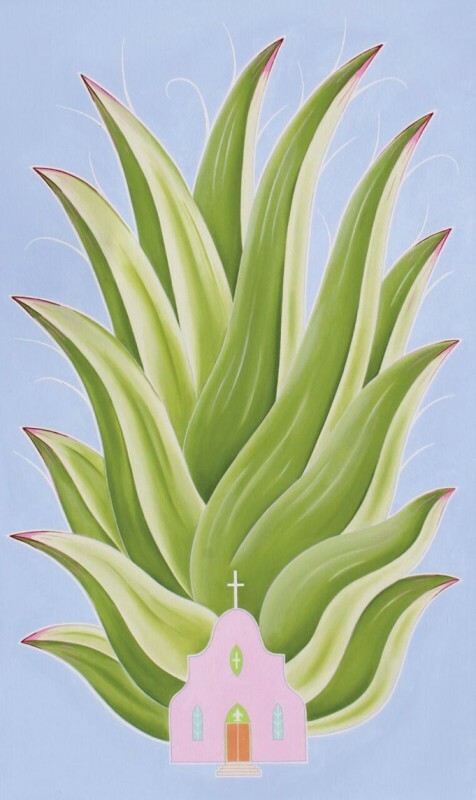 Harrington’s juxtaposition of the religious and the natural is on bravura display in “Agape Agave.” Here, a pink-hued mission-style church serves as foundation for a striking presentation of an agave plant, whose soaring leaves explore the top-most reaches of the canvas. Indeed, a viewer is left “agape” at the size of the towering plant as it dwarfs the mission church. In the show’s very first work, “Transmigration,” Harrington fills a 60-by-36-inch canvas with the hypnotic sight of two butterfly wings done in splashy shades of pink, pumpkin orange, and earthen brown. These grippingly realistic representations are anchored to a base formed by a temple’s roof. Clearly Harrington has chosen to concentrate his obvious mastery of subtle (a pale sapphire sky) and screaming shades of color in this one work. In “The Noble, Tangled Path,” Harrington’s most Salvador Dali-influenced piece, his determined realistic portrayal of a cream-colored pagoda structure is paired with the insertion of a human eye at the work’s bottom — a clear nod to one of Dali’s favorite motifs. It is in “New World Dandelion” where Harrington really flexes his fastidious brushwork muscles in creating a spectacular milkweed form that bursts out from the canvas like spokes from a carnival Ferris wheel or like a bleached-white fireworks display. It is absolutely mesmerizing. One gallery space over, Poole has lasered in on a brand of abstraction celebrating the power of an army of jittery vertical lines — so clearly apparent in “Back on Boogie Street” with its tight vertical clumps in a prismatic spectrum of colors, from red and blue to neon green, white, and purple. Poole’s works offer surfaces of brushstroke ripples, dimples, and small globules, all in obvious contrast to the mirror-smooth sheen of Harrington’s canvases. What tends to vary most among Poole’s 11 pieces is not so much the blades-of-grass bunching of verticals but rather their backdrop. In “As Above So Below,” Poole has chosen a black chalkboard background to contrast with the white retinue of verticals parading up and down the canvas. And in the triptych “Untitled 1, 2, and 3,” gun-metal gray holds forth in the background as pale blue and creamy lines march in lockstep up the canvas. Far from being totally wedded to the relentless presence of verticals, Poole celebrates the power of horizontals in “Smoke,” as seven of them slash across the canvas, with some of them intercutting with smudges of white verticals. With Harrington’s work profiting from up-close inspection, while Poole’s, by contrast, is best enjoyed from a middle distance, both shows allow the viewer to absorb the distinct power of dream-tinted realism and pure abstraction — and all within a small gallery stroll of each other.